Snowstom tương thích hầu hết các trình duyệt cũ (IE 5.x +, Netscape 6 +) cũng như các trình duyệt mới IE 6, 7, 8, Firefox, Safari, Opera. Snowstom tương thích với các trình duyệt trên các thiết bị di động iPhone, iPad và Android. Tuy nhiên Snowstom sẽ ngốn nhiều CPU khi chạy vì vậy với các thiết bị di động các bạn có thể thiết lập snowStorm.excludeMobile = false để người dùng thiết bị di động khi vào trang web của bạn sẽ không bị treo máy, hao pin. snowStorm.snowColor = '#99ccff'; // blue-ish snow!? Snowstorm can be fairly easily customized; some of the major properties are listed below. Whether the snow should start automatically or not. Limits the “floor” (pixels) of the snow. 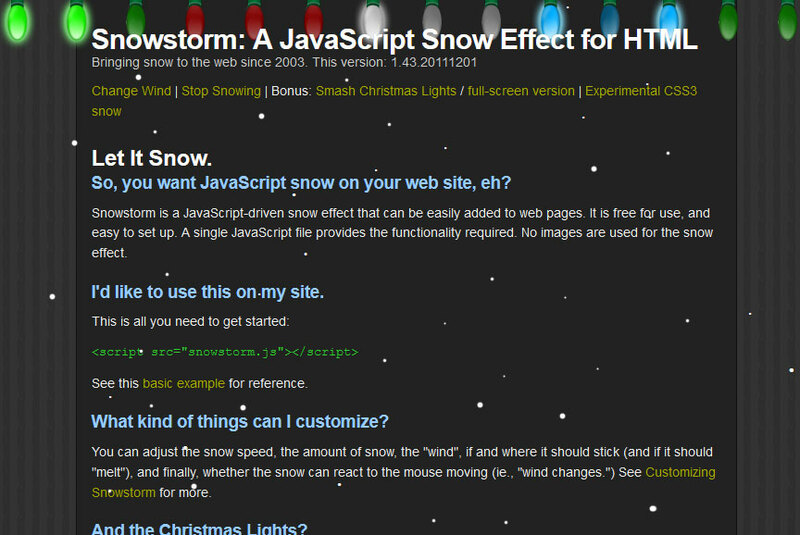 If unspecified, snow will “stick” to the bottom of the browser window and persists through browser resize/scrolling. Sets the maximum number of snowflakes that can exist on the screen at any given time. Allows snow to move dynamically with the “wind”, relative to the mouse’s X (left/right) coordinates. 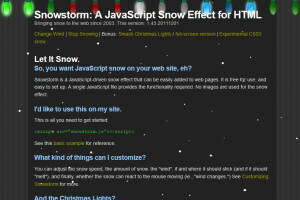 Stops the snow effect when the browser window goes out of focus, eg., user is in another tab. Saves CPU, nicer to user. Don’t eat (or use?) yellow snow. &bull; (•) = bullet. &middot; entity (·) is not used as it’s square on some systems etc. Changing this may result in cropping of the character and may require flakeWidth/flakeHeight changes, so be careful. Allows the snow to “stick” to the bottom of the window. When off, snow will never sit at the bottom. Element which snow will be appended to (default: document body) – can be an element ID string eg. ‘myDiv’, or a DOM node reference. true = snow not affected by window scroll. may increase CPU load, disabled by default – if enabled, used only where supported. Defines maximum X and Y velocities for the storm; a random value in this range is selected for each snowflake. Snowstorm has a few basic methods for controlling the snow effect. Sets the wind speed with a random value relative to vMaxX and vMaxY properties. Stops the snow effect in place. Continues snowing from a “frozen” state. Enables or disables the snow effect depending on state, same as calling freeze() or resume(). Freezes and kills the snowstorm effect, and removes related event handlers. Snowstorm will not work properly if other methods are called after stop().